OxGord a new leader in kitchen and home supplies presents our premiere homemade pasta maker. Now you can make delicious homemade Spaghetti, Linguini, Alfredo, and Angel Hair Pastas right from home. Make the perfect al dente pasta to pair with your favorite sauces, creams, and meats. 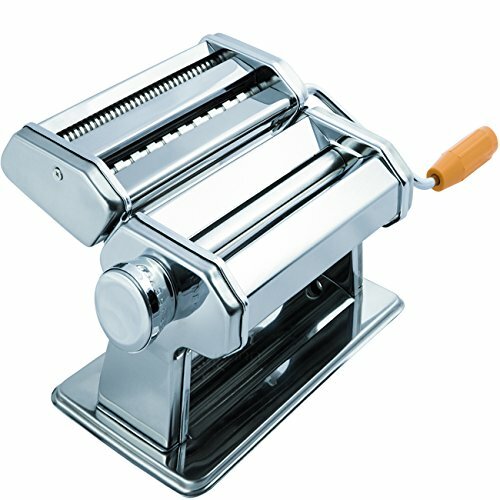 Constructed of solid stainless steel our pasta maker is built to last, giving you and your family years of culinary delight. Now you can enjoy delicious whole wheat pastas right from home using time honored culinary techniques. Our pasta makers easy click adjustable dial lets you roll doughs to 9 different layers of thicknesses, ensuring the perfect homemade pasta creations. Includes 3 blade attachments for various styles of noodles. Make your own sheets of pasta to be cut into ravioli, tortellini, lasagna and so much more. Easy crank handle is removable for your storage convenience. Pre cut holes allow you to mount our pasta roller to countertops or kitchen Islands. Stainless Steel components are dishwasher safe and easy to clean. Start Enjoying pasta the traditional Italian way and impress your dinner guests and family with your homemade culinary creations. Because you are buying from OxGord you can be confident in our 100% Customer Satisfaction Guarantee. If at any time you are not completely satisfied with your purchase feel free to return it to us for a full and prompt refund. At OxGord we are committed to providing our customers with high quality kitchen and home goods at an affordable price. If at any time you have questions about our products or need assistance with your purchase we would love to hear from you. STAINLESS STEEL CONSTRUCTION: Built to last Stainless Steel Rollers & Blades are Dishwasher Safe. EASY CLICK ADJUSTABLE DIAL: Allows you choose from 9 different thicknesses settings for the perfect dough. 3 BLADE ATTACHMENTS: Detachable Blades let you easily create 3 different types of pasta noodles. REMOVABLE HANDLE: Easy Crank Handle can be removed for storage. Pre-Drilled holes for clamping.